(This post is part of a week-long series on my Facebook page starting herefor Mental Health Awareness Week - click "not now" if it prompts you to join). I see a large number of people with stress. Even if that’s not why they come to see me in the first place, it often underlies the symptoms they describe, or makes them worse. Prolonged periods of stress can have a negative effect on your physical and mental health, causing problems with your digestive system, hormones, cardiovascular system (possibly even leading to high blood pressure, angina, heart attacks) and perhaps contributing to inflammation in the body. Many people with long term conditions such as psoriasis, arthritis, eczema or depression feel that stress makes their symptoms worse. Dinosaurs used to activate our "fight or flight" response! In order to understand how herbal medicine works on stress, we need to understand what happens during the stress response. Well, it’s an evolutionary reaction, coming from when we used to literally have to run for our lives from a dinosaur or sabre-toothed tiger. It’s called the “fight or flight” (sympathetic nervous system) response – either stay and fight the predator or do a runner. 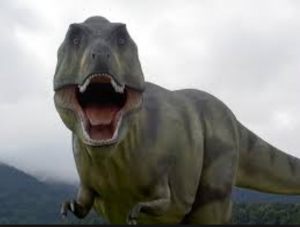 So when faced by the dinosaur, our bodies immediately release chemicals such as adrenaline, which triggers our hearts to beat faster, pumping the blood round our bodies to reach the muscles so we can react faster. This also shuts down our “rest and digest” (parasympathetic nervous system) response – blood is diverted away from our digestive organs (ever had that knot or butterflies in the stomach?) and skin as they are not essential at that moment. These days, we are lucky enough to live in the UK where we don’t have that daily threat of real danger. So our “fight or flight” systems are triggered by a full inbox or a traffic jam or queuing outside the exam room. If this stress is ongoing, then we don’t “use up” the chemicals that are constantly being produced by actually running from the dinosaur as we would’ve done in our caveman days. This means the body stays in a “switched on” state almost constantly, and you start to experience the symptoms I’ve been mentioning this week. (NB: this is exactly where exercising to beat stress comes in!). In herbal medicine we have a number of herbs that can help you “rest and digest” by relaxing the heart rate, opening up the tubes in the chest, and slowing adrenalin production. We also use herbs that bind to the same receptors as orthodox drugs like benzodiazepines do, but without the same side effects – the right combination will relax you and help you sleep without giving you that hungover feeling the next day. Hawthorn is one I posted about last week – it is used to help the heart pump more efficiently and is also calming, so is particularly good for those experiencing palpitations or that tight feeling in the chest that comes with panic (please visit your GP before self medicating if you are experiencing chest pain). And if you’re getting tense muscles in the neck and shoulders, leading to headaches, or stomach cramps, there are anti-spasmodic herbs that will relax the muscles so you don’t have to resort to painkillers. This is just the tip of the iceberg where herbs and stress are concerned! I often prescribe a daytime and a night time mixture where stress or anxiety is an issue; the daytime mix is calming and the night time mix is a little more sedating to help you get off to sleep, and stay that way. Get in contact for a no-obligation chat!